I’ve been on a hobak kick recently. (See last week’s recipe, for hobakjeon and hobak namul.) And that made me feel like making hobakjuk, a delicious, yellow-orange, pumpkin porridge. One confusing thing about hobakjuk is that its chief ingredient is actually a squash: kabocha squash. Kabocha, which comes from Japan, looks like a green pumpkin on the outside and a butternut squash on the inside. (See photo below.) I think most Westerners would call kabocha a pumpkin based on its shape and texture. Perhaps that’s why the English translation of hobakjuk is pumpkin porridge, not squash porridge. Maybe the translation/definition of hobak doesn’t matter that much anyway. Because kabocha squash can be difficult to find, some versions of hobakjuk use Western pumpkins or butternut squash instead. (The main difference is that kabocha squash tastes sweeter.) At any rate, hobakjuk is delicious, healthy and filling dish — one well worth making from scratch. 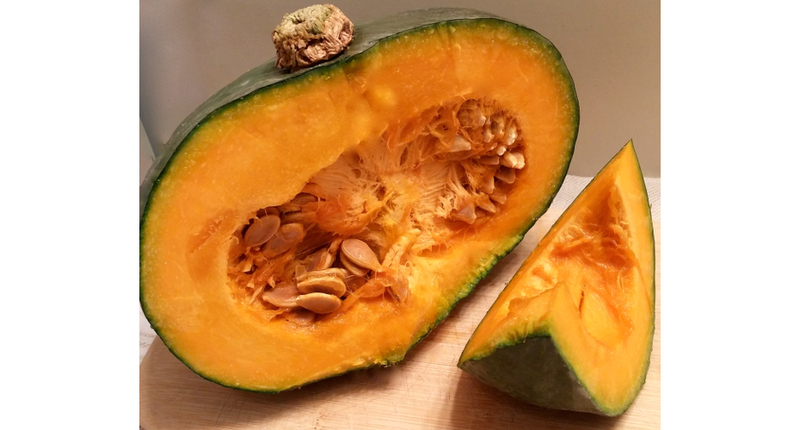 *The photos above show what a kabocha squash looks like when cut in half. As you can see, its shape and the color of its innards are very pumpkin-like. **You can buy rice flour at Asian grocery stores or the Bob’s Red Mill brand on Amazon.com for about $4. 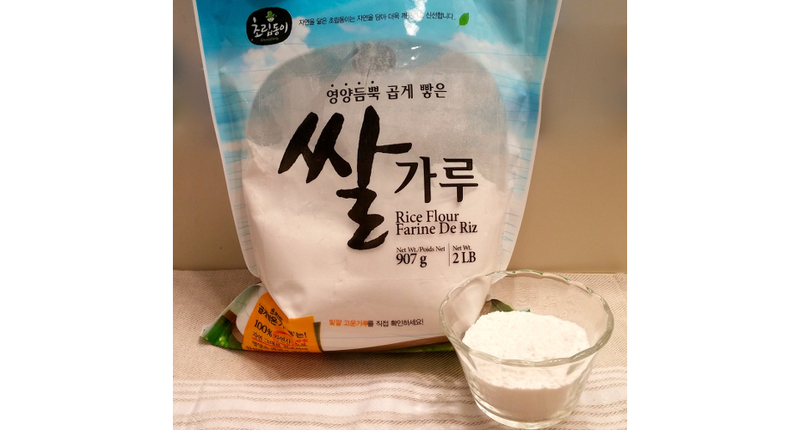 Rice flour is essentially the same thing as rice powder (pulverized rice). Above is a photo of a bag of rice flour and a small bowl of the flour itself. Rinse the squash/pumpkin and cut it in half with a large knife. Cut each half into small wedges and then “peel” each wedge by slicing off the rind surrounding it. Cut the peeled squash/pumpkin slices into ½-inch cubes. 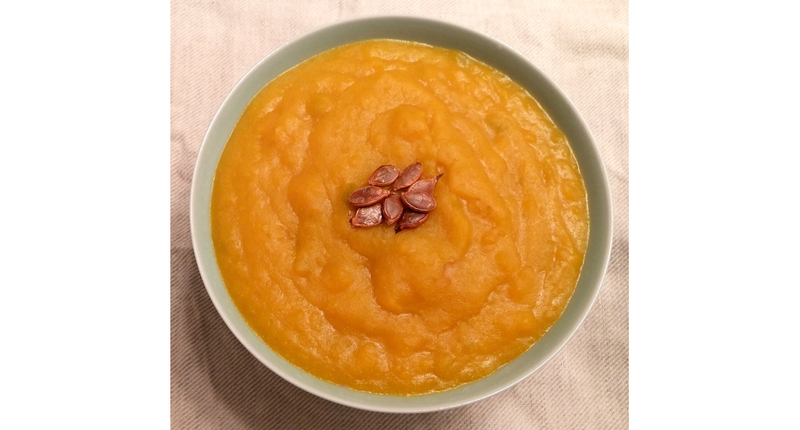 Place the squash/pumpkin cubes in a large saucepan with 4 cups of water. Bring pan to a boil. Cover and simmer until the pumpkin is very soft and breaks up completely when stirred with a wooden spoon, ~30 minutes. If you want to utilize the squash/pumpkin seeds for garnish, rinse them, pat them dry, toss them with oil, spread them on a cookie sheet and cook them at 400 degrees for ~15 minutes. Mix the rice flour with the remaining 1 cup of water in a bowl. Stir the flour mixture into the pan with the cooked squash/pumpkin. Bring squash/pumpkin/flour mixture to a boil over medium heat, stirring constantly. Lower heat and simmer 2 minutes. Divide porridge between 4 serving bowls, topping each serving with some of the toasted squash/pumpkin seeds, if desired.